Cover: It portrays them perfectly. Description: Arthur Drams works for a secret government security agency, but all he really does is spend his days in a cubical writing reports no one reads. After getting another “lateral promotion” by a supervisor who barely remembers his name, it’s suggested that Arthur try to ‘make friends’ and ‘get noticed’ in order to move up the ladder. It’s like high school all over again: his attempts to be friendly come across as awkward and creepy, and no one wants to sit at the same table with him at lunch. In a last-ditch attempt to be seen as friendly and outgoing, he decides to make friends with The Alien, aka Agent Martin Grove, known for his strange eating habits, unusual reading choices, and the fact that no one has spoken to him in three years. Starting with a short, surprisingly interesting conversation on sociology books, Arthur slowly begins to chip away at The Alien’s walls using home-cooked meals to lure the secretive agent out of his abrasive shell. Except Martin just might be something closer to an actual secret agent than paper-pusher Arthur is, and it might be more than hearts at risk when something more than friendship begins to develop. Please note this book has a Heat Rating of zero. I wasn’t sure if I should buy this book, because it’s so short and rather pricey considering its length. But dear fellow book reviewer Annie told me to read it and she never misguided me, so I bought it. I don’t regret investing even one cent! 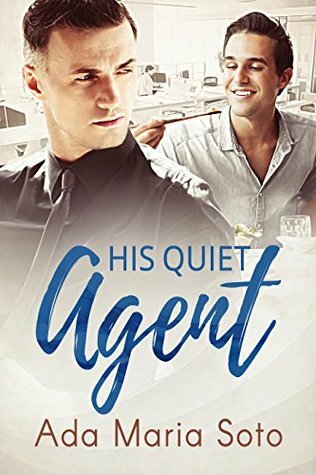 His Quiet Agent is everything I wanted and more. I really don’t understand how Ada Maria Soto managed this, but those 156 pages present some of the most well-developed characters and relationship I’ve ever read. It doesn’t even feel like under 200 pages. If you’d tell me I read over 400? I would believe it. I fell in love with Arthur right from the beginning, especially after him wondering if the plants at the office were real or fake. I’m known to touch flowers and plants because I’m always wondering this myself. I really enjoyed his awkwardness as well. It doesn’t come across as forced Oh-I-need-an-awkward-character, he simply is awkward. (Typing awkward three and now four times in a row is awkward btw). Martin was a little bit harder to love at first, because you know next to nothing about him but he was so interesting and I was excited every time Arthur chatted him up. Or didn’t chat him up because he respected Martin’s wishes. Sadly this isn’t often the case in romance books. Speaking of romance. Oh my God, the romance in this book…So my cup of tea! It’s totally innocent but so true somehow. And the love declaration scene? God yes! If you read nothing else, you have to read that scene. But there isn’t only romance and a healthy romantic relationship in this book. We’ve got a fun, badass lesbian character, mystery and a nice pinch of drama. Is there anything else you need? Give me more real asexual romances! *affiliate link: this DOESN’T mean you pay more, I simply receive some money if you decide to buy His Quiet Agent.